Want to Honor a Hero in Your Life? 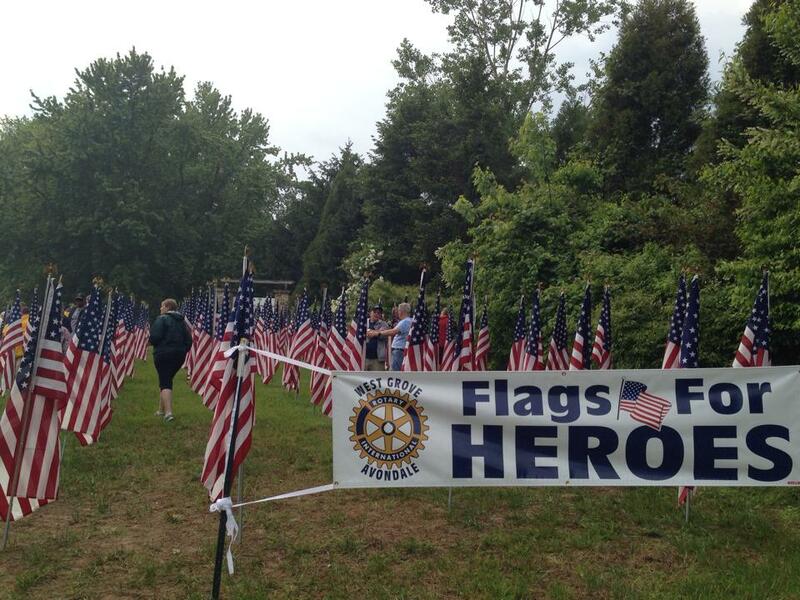 Several years ago, as we were putting up flags, a woman pulled over and said she just had to stop because she knew that when there were this many flags, that they were representing real people, real heroes. She later agreed to be filmed in this video. You see, Jill Hardy had lost a son in Iraq and the flags really meant something to her. View the linked video to hear her words. Please consider sponsoring a flag for our annual "Flags for Heroes" event. Flags can be sponsored by downloading and filling in the flyer located on the left side of this page. Checks can be mailed to the address shown, or pay $50 using the button below. Make sure you tell us your hero's name and why you are honoring them! All proceeds go back to the community, region, and international Rotary projects that we choose to support. Flags will be displayed at the intersection of 796 & Baltimore Pike in Jennersville from May 23rd to May 28th (depending on weather). A list of heroes and their sponsors will be printed (with your permission) in the Daily Local News, the following week. The West Grove-Avondale Rotary Foundation is a 501(c)3 non-profit organization. Your donation may be fully tax-deductible.